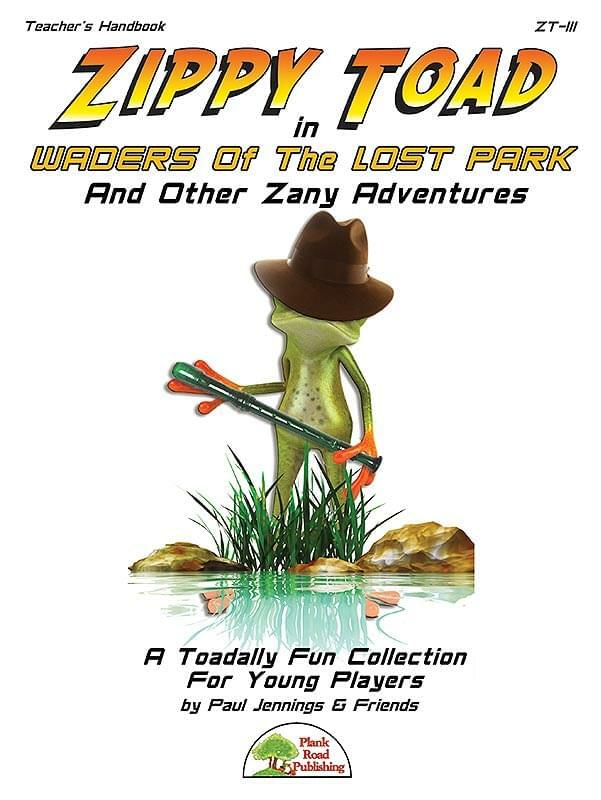 Zippy Toad In Waders Of The Lost Park - Zippy's first tune is his top-rated tune and sets the tone for his illustrious career. There are two parts: a simple B, A, G part, and a harder one using low D and E, G, A, B, and high D. Use either or both. The Big Boing Theory - After a big, punchy intro, we sail into an infectious minor groove and what may be one of the easiest tunes in the collection, demanding only B, A, G and simple rhythms. Boing! Zippy Went A-Courtin' - Zippy has a bit of toady romance, and students have a chance for an easy duet, though the tune works fine with just the easy part. Do The Zippy Toad Slide - There's no slide like the Zippy slide, and in between the smooth moves, your students get to do some simple questions and answers on B, A, and G with Zippy. Listen to the excerpt to hear what we mean. Zippy The Jingle Toad - Nothing says the holidays like a toad covered in jingle bells. There is a harder part that plays much of the melody and an easier part that just requires G, A, B, and C. Use either or both together. Ho, ho, ho! And as a special bonus... CowaBoinga - Zippy leads your students through an upbeat surf-style blues rock. Part 1 requires low D, low E, G, A, B, C, and high D. Part 2 can be performed with just G, A, and B. Many of the tunes have extra features, multiple versions, and downloadable options to make them more usable with your students.